To join the celebration, we present here the brain-related project "New magnetic biomaterials for brain repair and imaging after a stroke", led by Dr. Anna Rosell, from VHIR, and in which Prof. Anna Roig, from ICMAB, participates. According to the World Health Organization, 15 million persons suffer a stroke worldwide each year. However, the only available treatment is the acute thrombolytic therapy (pharmacological or mechanical) which is being administered to less than 10 % of stroke patients due to strict selection criteria. In contrast, neuro-repair treatments could offer the opportunity to include most stroke patients by extending the therapeutic time window. 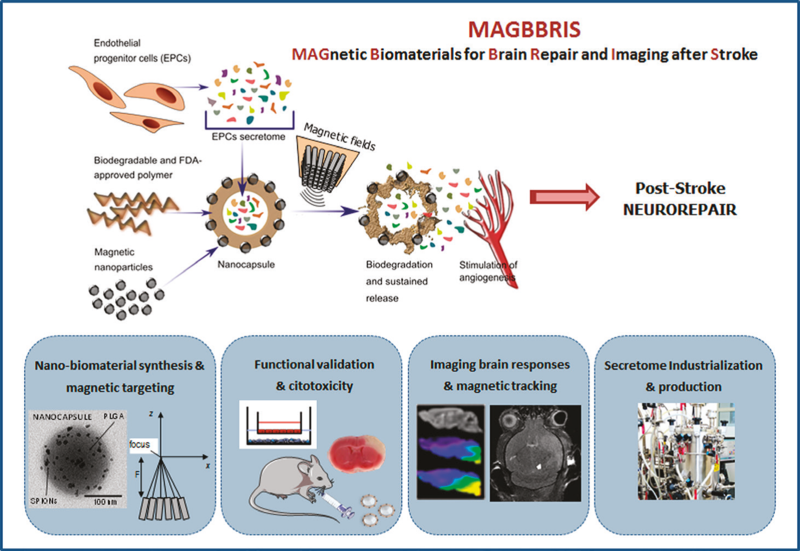 The European project (EURONANOMED3 call) MAGBBRIS (New Magnetic Biomaterials for Brain Repair and Imaging after Stroke) aims to achieve tissue repair in the event of an ischemic attack by engineering novel magnetic nano-biomaterials. The goal of the project is to demonstrate that growth factors secreted by endothelial progenitor cells, having proven potential to induce tissue repair, can be encapsulated in these magnetic nano-biomaterials and successfully and safely transplanted into mice brains, with the guidance of magnetic fields, to induce tissue repair. The project will provide an advanced therapy that could be translated to a clinical stage as noninvasive, safe and available to most stroke patients. Biomaterials will be fully validated including among others aspects cytotoxicity and therapeutic properties both in vitro and in vivo; advanced imaging techniques (PET, MRI and Optical Imaging) will be used to monitor and guide the delivery of the biomaterials and to assess the therapeutic effect in vivo over time in a mouse model of cerebral ischemia. The project consortium is made up of a highly multidisciplinary, materials-science, biomedical and clinical research and industrial partnership. The project is coordinated by Anna Rosell, from Vall d’Hebron Research Institute (VHIR), and has the following partners: Anna Roig, Institut de Ciència de Materials de Barcelona (ICMAB); Fabien Gosselet, University of Artois (France); Maria Picchio, Ospedale San Raffaele IRCCS (Italy); Filip Jelen, Pure Biologics Ltd. (Poland); Peter Kopcansky, Institute of experimental physics, SAS (Slovakia). If you are interested in this research, please read this news post at VHIR by Anna Rosell. The ICMAB wants to join the celebration of the BAW by explaining two of the brain-related projects that our researchers work on: a project on "Nano-structured electroactive materials for electrodes in Central Nervous System (CNS) stimulation and repair", led by Prof. Nieves Casañ from ICMAB, and a project on "Magnetic biomaterials for brain repair and imaging after a stroke", led by Dr. Anna Rosell, from VHIR, and in which Prof. Anna Roig, from ICMAB, participates.